From Novemeber 10-16, the Chamber Music Society of Lincoln Center went on tour to Cleveland, OH; Easton, PA; and Lewistown, ME; performing masterworks by George Crumb and Bela Bartók. The performances were very well received by audiences in each location. This past month, I had the wonderful pleasure of touring with artists from the Chamber Music Society of Lincoln Center in a program highlighting two gems of the 20th Century Chamber Music repertoire: Bartók’s Sonata for Two Pianos and Percussion and George Crumb’s Music for a Summer Evening (Makrokosmos III) for Two Amplified Pianos and Percussion. 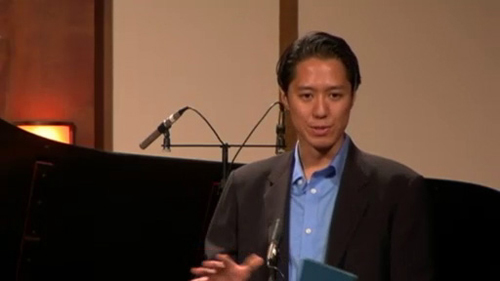 It was a wonderful opportunity to perform both of these rarely programmed masterworks side by side. In addition, it was very special to perform both the works with my dear friend and colleague, pianist Gilbert Kalish (pictured with me above). For Gil, this program was especially meaningful since he premiered the Crumb in 1974. About two years ago, CMS had programmed the Crumb on a performance that was supposed to take place at the New York Society for Ethical Culture—this was during the period when Alice Tully Hall was under renovation. Just before the performance began, fire alarms started going off and the hall had to be evacuated. Imagine over 600 people (including George Crumb who was in attendance), standing outside in the snow and cold waiting to see if the performance would go on! Unfortunately, the alarm was due to an electrical fire and the concert had to be canceled. However, we decided to reschedule the concert for the next day for any of the brave concertgoers who did not want to miss the program. 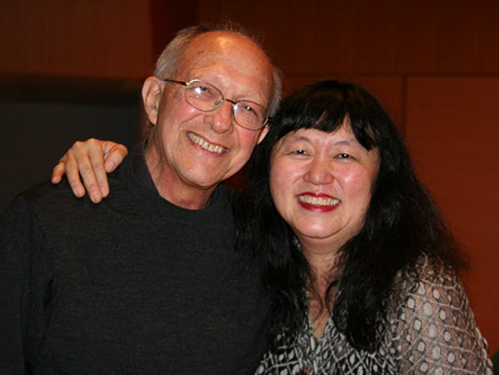 At that rescheduled concert, two representatives from Opus 3 Artists who manage CMS’s tours, Pat Winter and Rob Berretta, were blown away by both the beauty of Crumb’s masterpiece and suggested CMS take the program on tour. Bartók’s Sonata for Two Pianos and Percussion was commissioned by the enterprising Swiss-conductor Paul Sacher to commemorate the tenth anniversary of the Swiss chapter of the International Society for Contemporary Music in 1937. Bartók’s use of this innovative instrumentation as well as his treatment of rhythm and harmony was remarkably forward thinking for its time. 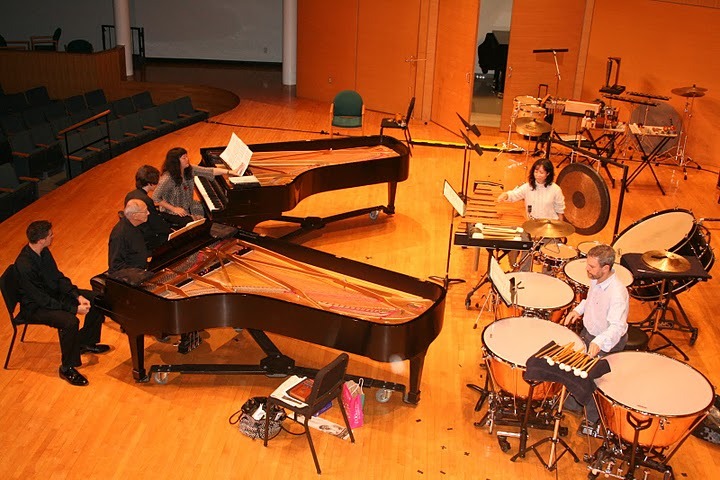 It wasn’t until 1974, with the genesis of George Crumb’s Music for a Summer Evening (Makrokosmos III) for Two Amplified Pianos and Percussion, that the repertoire for two pianos and percussion finally had a piece that could rival the Bartók. George Crumb’s Music for a Summer Evening is truly one of the most remarkable works of the 20th Century. Crumb’s subtitling of the work Makrokosmos III, is a subtle homage to Bartok (Bartok wrote 153 Mikrokosmos, instructional pieces for piano). Crumb drew additional inspiration from both musical and literary figures ranging from Bach to Rilke. The result is a piece of extraordinary breadth and imagination. Within the five movements, many extended instrumental techniques are implored to create a truly unique sound world. The pianists are called upon to play within the piano and the percussionists use a wide variety of instruments (including a gong and a jug). The tour performances were remarkably successful and well received by audiences. It is always a risk to program a concert that includes such large 20th Century masterpieces–all the artists involved were gratified by the overwhelmingly positive response. Since two of the performances were on college campuses, it was great to see a large number of young students. There was a palpable sense that the younger audiences truly understood and appreciated the musical language on a deep level. The opportunity to tour with both the Bartók and the Crumb was certainly a highlight of the season. I would like to sincerely thank the three courageous presenters who overcame the logistical and practical hurtles to make this tour a reality: Bates College in Lewiston, Maine; Lafayette College in Easton, Pennsylvania; and the Cleveland Chamber Music Society. Without their commitment and enthusiasm, this project would not have come to fruition in such a meaningful way. CMS will be presenting both the Bartok and the Crumb this coming May at Alice Tully Hall. Click here for more information. 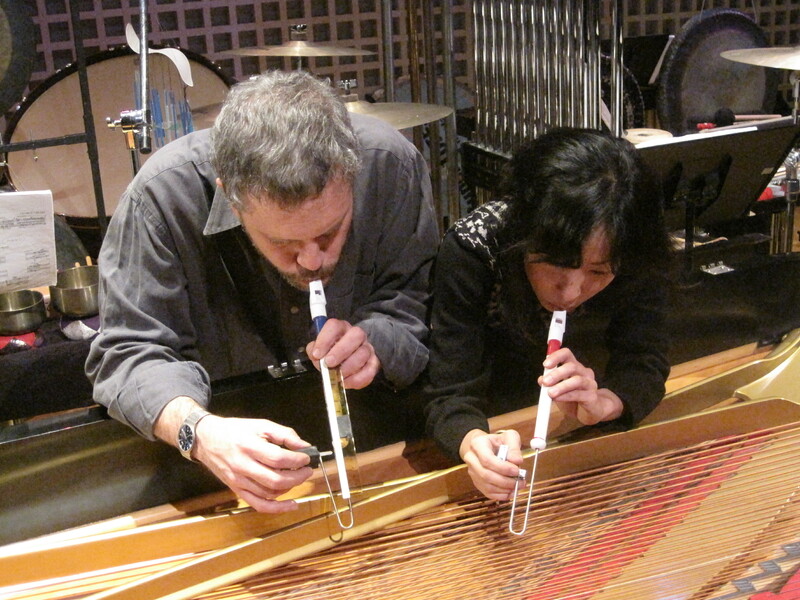 Also, thank you to Lois Rose (from the Cleveland Chamber Music Society) for letting me post her photos of Gil Kalish and myself, and the Bartók setup. The Chamber Music Society of Lincoln Center, responding to the growing popularity of casual listening environments, inaugurated a new variation of its Rose Series concerts, Late Night Rose. Beginning at 9:30, audience members seated at tables enjoyed complimentary wine, commentary by series host Patrick Castillo, and a concert of music by the two Schumanns, Clara and Robert. With an elegant room of our own, intimate and with excellent acoustics, the temptation to mount a new series of salon-style concerts finally proved irresistible. So, following a 6:30 Rose Studio concert (in standard seating configuration), the energetic and fearless CMS production staff attacked the room, and in under half an hour turned it into a sublime café environment, complete with round tables, candles and reduced lighting. The atmosphere was magical, and the long line of ticket-holders was soon after admitted into a Rose Studio the likes of which they had never seen. Another significant feature of Late Night Rose is the presence of a concert host, a new addition among CMS offerings. Long-time ArtistLed Artistic Administrator Patrick Castillo was a natural choice: Patrick has been hosting and leading more events at Music@Menlo every summer, and has naturally grown into a knowledgeable and entertaining public personality. The program featured two extraordinary works: Clara Schumann’s Piano Trio, an under-valued composition that deserves much more exposure on the concert stage, and her husband Robert’s beloved Piano Quartet. With insights from Patrick, coupled with brief demonstrations of noteworthy excerpts by the musicians, the audience’s appetite was whetted, and their attention focused. Plus, a complimentary glass of wine helped everyone relax and enjoy the company of neighbors at their tables. The players, who all delivered stunning performances, were violinist Yura Lee, violist Paul Neubauer, cellist Andreas Brantelid, and pianist Juho Pohjonen. 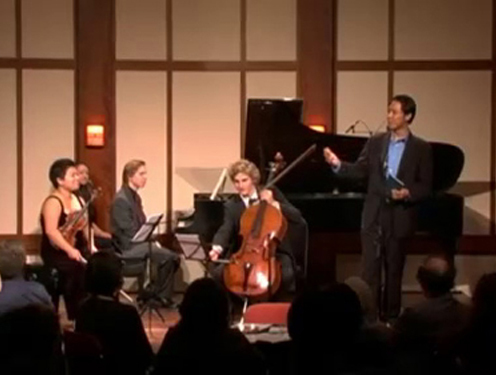 The Late Night Rose series is streamed live on the internet via the CMS web site: www.chambermusicsociety.org. The next concert in the series is January 13th at 9:30pm, and will feature performances of Benjamin Britten’s Phantasy Quartet for oboe and strings, plus the immortal Schubert Cello Quintet. Performers include violinists Kristin Lee and Yura Lee, violist Beth Guterman, cellist Nicholas Canellakis, and yours truly. Don’t miss it!